Turn on the television anytime and the chances are you are going hear music that is produced using digital orchestration and sample libraries. So, the orchestra you are hearing is not, in the conventional sense, an orchestra at all – it just sounds like one. If the music production is done well, it should be almost impossible to distinguish between what you are hearing and what a “real” orchestra would sound like. 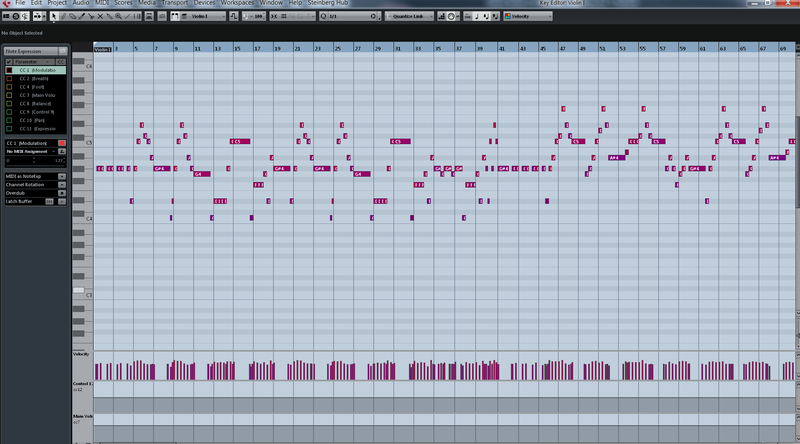 That is the art / science of digital orchestration. The music for CSI, The Mentalist, Dexter and many more, is all produced “inside the box”. It is now almost impossible to find an advert where the music is not produced in this way. Tight production schedules and limited budgets usually don’t allow for recordings of real orchestras, so the sample based recording isn’t just a demo or a mock-up, it is the final cue. Click on the link below. Here, there are two examples of an orchestral piece by Vaughan Williams and two examples of a Beethoven string quartet. One of each piece is produced using digital orchestration – which is which? More and more, and for the same reasons, this also applies to films. Low and mid-range budget films will never be able to finance studio recording sessions with a large orchestra, music director, producer, recording and mixing engineers etc. Even in some blockbuster films where large Hollywood style orchestras are used, the soundtrack will often be enhanced with extra sampled percussion and brass etc. What is sampling and how does it work? Not Robots and Nothing to do with Synthesizers! When you hear sampled music, you are hearing real musicians playing real instruments, – a solo violinist may well be playing a Stradivarius! – but, every single note and articulation has been sampled – recorded – separately and often many times over. Every note an instrument can play and in every way – ppp, pp, p, mp, mf, f, ff, fff, sfz, staccato, detache, legato, flautando, harmonic, con sordini, pizz, and so on, is sampled in meticulous detail. Often, but not always, these samples will be recorded “dry”. That is, with absolutely no ambient sound, echo, reverb. If you listen to dry samples, they are very uninspiring – if you have ever been in an anechoic chamber you will get the idea. Reverb to taste is added later. More about reverb anon. The world leading Vienna Symphonic Library (VSL) have built their “Silent Stage” so that all their sampled recordings are completely dry. A full orchestral sample library will go through this process for every instrument. In addition, where sections of players are required e.g. First Violins, Second Violins etc. there may well be 14 or more players playing together. Full professional sample libraries are massive containing millions of samples. An important milestone in orchestral sampling occurred in 2002 with the development by Vienna Symphonic Library of the “interval legato concept”. Anyone who has learned to play an instrument to a reasonable standard will be aware that it is not enough just to play the correct notes in the correct order in the correct time. Good phrasing, and especially legato phrasing, will utterly transform a piece. Hitherto all sample libraries faced the same problem – how to join notes together so the phrase or passage sounded completely authentic. In 2002 VSL developed complex algorithms which overcame this problem, the results were astounding and this process has been taken up by all sample developers ever since. Click on the link below to listen to a 1st Violin section from VSL. Around the same time VSL also developed the method of using different samples for repeated notes. Most music contains many parts where the same note is repeated many times. If the same sample is repeated many times the result is not at all convincing and is known as the “machine gun effect”. The developers created a system where each repeated note triggered a different sample of the same note giving a much more realistic sound – this is now universally referred to as “round robins” and all serious sound libraries use this system. What do you do with 10 million samples? Fortunately the companies producing such vast libraries also produce highly sophisticated software to control and manipulate the samples. 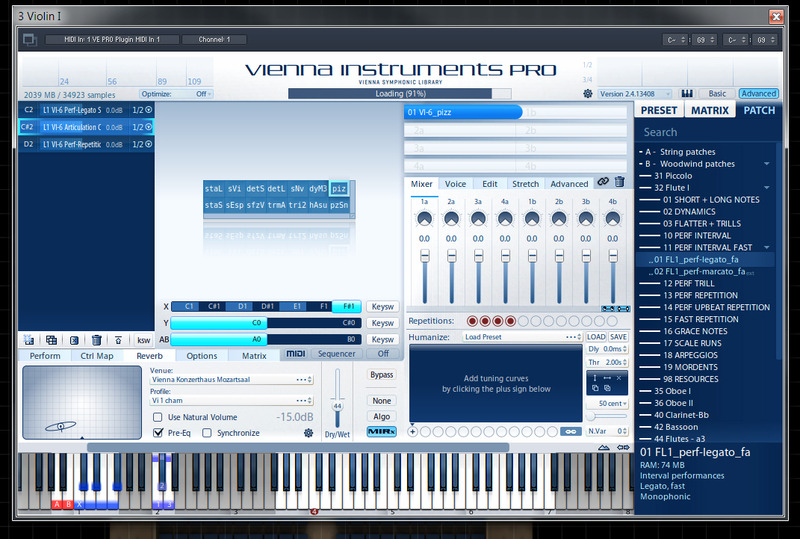 The screenshots below show part of the user interfaces for VSL’s Vienna Instruments and East West Quantum Leap’s PLAY software. It is here that the user controls and manipulates the samples. There are many other companies with similar products but these are the two with which I am most familiar and use on a daily basis. Usually there is a matrix where the user loads the samples required. In some pieces only a few articulations will be required e.g. sustain and legato, for other more complex pieces a wide range of individual articulations will be needed. This can be very demanding on computing power and often slave computers with powerful processors. a lot of RAM and several solid state hard drives, will be needed to take the strain. A set-up like this can be used as stand-alone connected to a keyboard where the player can play, for example, an incredibly realistic string or brass section. This is commonly used in “live” situations. This of course has been and continues to be controversial as many musicians see it as a threat to their jobs and there is no doubt that this does and will continue to happen. On Broadway in 2003 there was a Musicians Strike which began as a strike over pit minimums and rapidly escalated. In London’s West End Cameron Mackintosh moved Les Miserables from the Palace Theatre to the Queen’s Theatre leading to a reduced orchestral size – a smaller pit – and increased use of samples triggered from keyboards. So, from the audience’s perspective there was no reduction in sound produced by the orchestra. 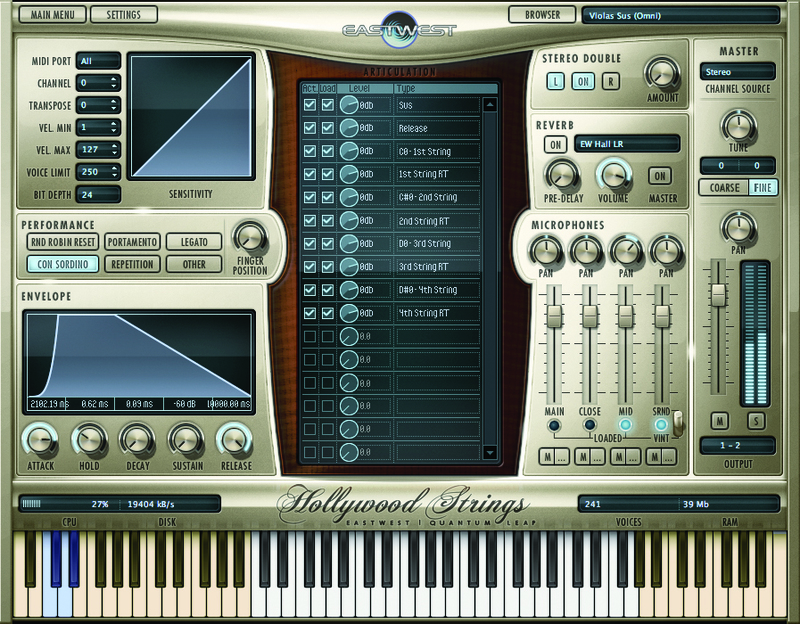 In music production for TV, Films and CD type work these interfaces will normally connect to a DAW (Digital Audio Workstation) such as Cubase, Protools, Studio One etc. Here the user controls the whole audio project with as many instrument tracks as required – it could be over a hundred. Below are examples of editing widows from Cubase. The coloured track lanes are individual instruments which are processed as required and eventually mixed down to stereo, or surround sound. It is in these widows that all the minutiae of editing takes place. The process here is similar to standard multi-track recording which of course is the staple of many recording studios. In some cases this is still done using multi-track tape recorders – analogue – but more and more, using computers – digital. Each method has its own champions and many a heated discussion takes place over their relative merits. Screenshot 3 is from “Following Lear” Zontul Films Ltd currently in production. The music was composed and produced by David Watson (Kanon Digital Orchestration) using the digital orchestration techniques described above. A mixed stereo file was sent through the ether to Shonk Studios Oxford where soprano Thomasin Trezise recorded the vocals which were then sent back to Kanon for mixing and mastering. This track is not finalised but you can listen to the work-in-progress by clicking on the link below. You can also see Tim Wilson preparing some of the storyboards and animations for the piece. I mentioned above that many sample libraries are recorded completely dry i.e. with no ambient sound on the recording. This has the benefit of giving the producer much greater control of the final audio track. Reverb techniques have come on a long way since the days of the old “spring” reverb. This was literally a spring inside a plastic pipe which could be inserted into the audio path. It gave pretty impressive results for its time but if you want to see one now you will have to go to a museum! There is a vast array of very high quality hardware and software reverb systems available. Where pure acoustic realism is sought, rather than a reverb or echo “effect”, the most commonly used system is that of Convolution Reverb or Impulse Response. Without going into the physics of the process, convolution reverb involves audio engineers going to a particular venue – a concert hall, scoring studio, a church or even a famous cathedral and actually recording the directional sound impulses of that space. Using these programs and impulses you can then place your “dry” instrumentalists or singers “virtually” in that space. The realism of the results can be quite amazing. VSL’s MIR, which I use a lot, goes even further taking up to 5000 impulse responses per room. They will also consider the placement of any instrument on a stage and the directional and sonic characteristics of the instrument. Microphone placement is very important and it is possible to listen as the conductor, someone sitting near the front of the auditorium or at the back or in the balcony and so on. Click on the link below to listen to excerpts from the Overture to The Marriage of Figaro. This first one I have kept mercifully short. It sounds raucous, out of balance and truly awful. Yet, apart from the addition of the MIR impulses and instrument placement, it is identical to the second example which I hope is more pleasing to the ear. This second example is placed in the Mozartsaal in Vienna. The speed of technological advance is unlikely to slow down. Computers are getting more powerful, processors ever faster, solid state hard drives will become the norm – this can reduce the need for huge amounts of RAM. The professional sample library market is very competitive with new top-end products advertised in specialist magazines every month. The digital / virtual orchestration area of the music business is almost unrecognisable from that of just a decade ago. Where does that leave our living breathing musicians? The business will continue to change and musicians will have to adapt, there is no doubt about that. However, music conservatories across the world continue to produce incredibly talented musicians. Perhaps the British – but not the Scottish – Government has come up with a solution – stop producing musicians! The introduction of the Ebac. The Ebac will essentially be compulsory for all maintained schools. The Ebac does not include music and the arts! Any school which does not conform cannot be graded as outstanding. I feel sorry for the head teachers – especially those with a creative arts background – who will have to make very difficult decisions. I suppose we get the governments we deserve. After all we elect them. Or at least at the last election the 66% of us who voted did. Perhaps there is something to be said for a benign dictatorship – especially if musicians are in charge!